Seeking veterans for unique volunteer opportunity No one knows more about the issues facing a veteran—while deployed or on the home front—than another veteran. No one knows more about the issues facing a veteran—while deployed or on the home front—than another veteran. If you are passionate about helping fellow veterans, think about joining our team. As a volunteer, you will provide support and linkage to needed resources for Michigan military service members and veterans. You can view the complete volunteer position description here. If you meet these qualifications and enjoy helping veterans and service members, we encourage you to apply to become a volunteer here. If you would like more information or have any questions about the application process, please review our FAQs about volunteering below. You are also welcome to contact us at buddytobuddyVVP@umich.edu or 1-888-822-8339. I’m not a veteran. Can I still volunteer with the program? We do not currently have volunteer opportunities for non-veterans. We require that all our volunteers be military veterans in order to build trust and connect with the soldiers and veterans they serve on a deeper level. I’m not a Post-9/11 veteran. Can I volunteer with the program? Yes. 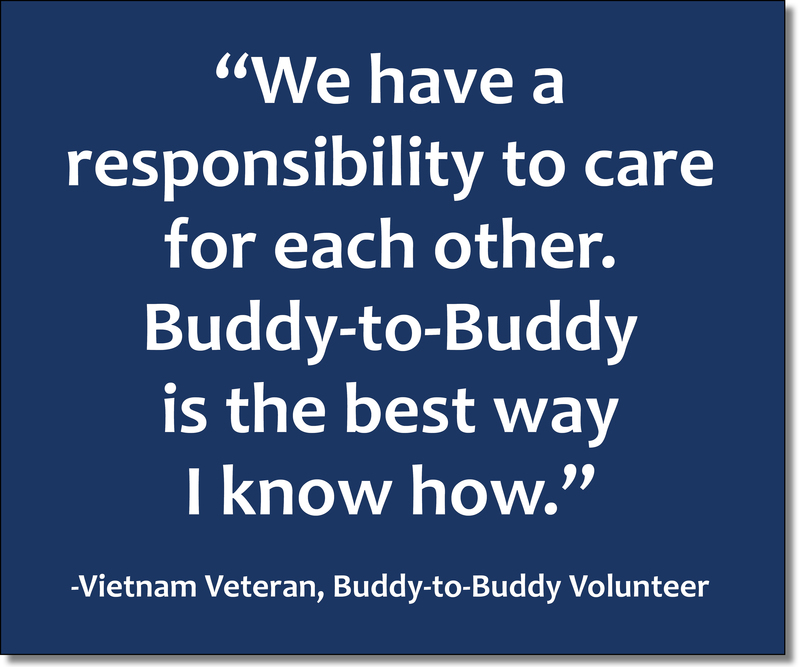 Veterans of any era are eligible to be Buddy-to-Buddy volunteers. Many of our volunteers are Vietnam, Korea, and Desert Storm-era veterans. I’m currently in the National Guard, can I volunteer with the program? This is assessed on a case-by-case basis. If a soldier is in the process of retiring or leaving the Guard, we can definitely work with him/her on becoming a Volunteer Veteran once their transition out of the Guard is completed. We do not usually work with active status NG soldiers since our confidentiality guidelines might conflict with NG soldiers needing to report to their chain of command. I work for a large organization, and we have a group interested in volunteering with the program for Veterans Day/ National Day of Service/ Memorial Day/ etc. Are there any opportunities available? Unfortunately, we do not have any one-day volunteering opportunities or opportunities for large groups. The Mission Continues has an active presence in Detroit and regularly recruits volunteers for service projects. I’m a veteran interested in being a Volunteer Veteran. What exactly would I be doing in the program? You may serve in a few ways, depending on your preferences and background. This will either be assignment to an NG unit and armory, or as an at-large volunteer, in which case we will contact you with referrals. Many of our volunteers attend veteran outreach events where we have a Buddy-to-Buddy table. If you have special expertise such as in law or with veterans benefits, we will be happy to take advantage of that expertise if you are willing. We also find that our volunteers run into veterans in need in their day-to-day lives and provide help in those situations as well. Our volunteers participate in weekly support calls with program staff and other volunteers where resources are shared and concerns are discussed. How do I apply to be a Volunteer Veteran? Please apply online through our application page. What does the application process entail? How long will it take for me to start volunteering? Once your application is received, we will review it and contact you within about a week for an interview to ensure you are a good fit for the program. After the interview, you will go through a one-day training session. The program usually conducts a training every six weeks. After the training, a background check will be done. The background check takes two weeks to be completed. Once completed, our staff will work with you to find the best fit for your service. Please be advised that it may be a month between your time of application and when you begin doing your volunteer work. What does the one-day training cover? In the training, we cover program policies, volunteer roles and responsibilities, what to expect in the armories, communication skills, recognizing potential problems, handling emergencies, using the volunteer website, Michigan resources, and other useful information for volunteers. Can I choose the armory where I will be assigned? We will definitely take any requests and personal preferences into consideration, however, we work with the Guard in order to identify which units and armories are most in need of a volunteer. We also try to assign volunteers to armories that are within 50 miles of their place of residence.